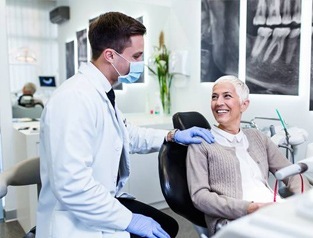 Following advanced tooth loss, your Greenfield dentist and dentistry team at the Advanced Dental Treatment Center can offer a wide range of tooth replacement options to fully repair your smile following even the most extensive tooth loss. 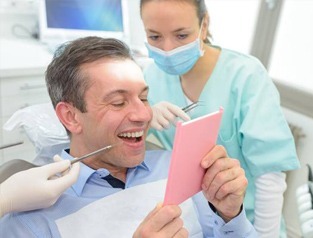 If you’ve lost one or both full rows of teeth, we offer a variety of denture options, including All-on-4 dentures that, as the name suggests, are supported by just four dental implant posts. If you’re interested in learning more about your tooth replacement options, including All-on-4 dental implants, call our Greenfield dental office to schedule a consultation visit today. We’ll be happy to review all of your treatment options and help you to find the best option. All-on-4 is a unique dental implant supported tooth replacement method that utilizes strategic implant post positioning to provide support for an entire denture using the naturally denser parts of the jawbone. This limits the need for more advanced and invasive preparatory services like bone and soft tissue grafting as well as improving the patient’s chances for successful dental implant placement. All-on-4 dentures anchor the entire tooth replacement prosthetic with just four dental implant posts positioned to implant into the densest parts of the jawbone. Two dental implants are positioned vertically to support the front of the denture. The other two dental implant posts are positioned diagonally from the back of the denture implant into the front of the jawbone. This innovative dental implant placement process improves the chances for successful implantation. 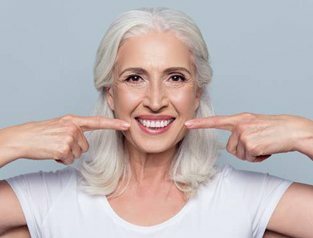 Unlike traditional implant supported dentures that rely on several dental implant posts placed along the entire jaw line to provide support for the denture, this innovative placement method allows a greater number of people than ever before to receive an implant supported denture restoration in less time and with less discomfort than ever before. How do I Care for My Smile After All-on-4 Placement? Like other dental implant supported dentures, you can simply brush your All-on-4 denture like healthy teeth. We may recommend you use a softer toothbrush and/or less abrasive toothpaste to avoid unintended dental wear. You may also want to use an air or water flosser to remove food particles and plaque that can accumulate between the denture base and gum line. For best results, we recommend you brush your All-on-4 denture at least two times each day. You can also brush between meals or use oral rinses to remove stuck-on foods. Don’t forget to visit our dental office twice a year for dental exams and teeth cleanings to ensure you maintain a healthy, functional smile.